Show off your gorgeous artwork in a creative and exciting way with our contemporary three panel wall art sets. A stunning feature for your home or inspiring decoration for the office, these framed multi canvas prints bring any room to life. Available in 12 different sizes, there's a triptych canvas to suit any wall, big or small. Mounted onto a custom made wooden frame, your triptych wall hanging is truly unique. 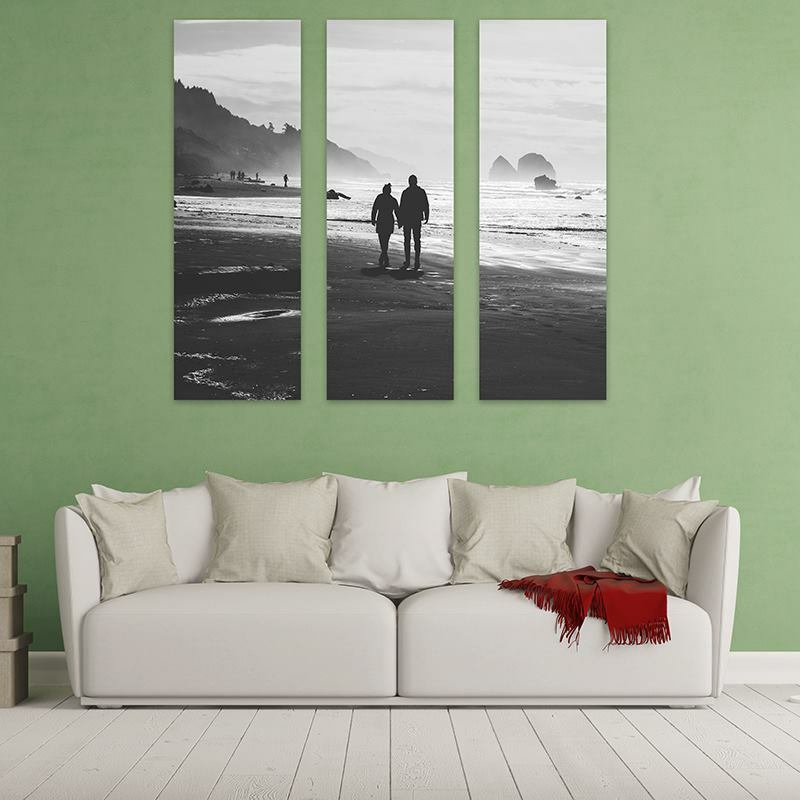 Whether you’re a photographer looking to display your art in a stylish fashion, or simply want to create a feature piece for your living room, three panel wall art is your answer. Choose your photo, painting or design and transform it into split canvas prints, giving your space a modern, fresh feel. Don’t just treat one room to stunning wall art; buy 2 sets of triptych prints and receive another set free. You can create 3 separate designs – simply add your first design to the basket then go back to create your second, and repeat! We use digital canvas printing to lock in the colour and ensure long-lasting vibrancy. Your printed canvas is then trimmed to size, mounting your split canvas prints by hand to the FSC certified wooden stretcher frames. Every part of the process is done by hand and quality checked at every step of the way. This means your triptych multi-panel is of the highest possible standard, guaranteed to impress. Your designs are printed as one before the canvas is split. This means your image has perfect horizon match, eliminating any jumps in print and misalignment. Some things to watch out for in your design are the crop panel cuts i.e. where the breaks in your picture will occur, but you can clearly preview this when designing. Our sizing options display the overall size – from the start of the first panel to the edge of third panel – as well as the individual panel sizes. If you have a bespoke sizing request, please get in touch. Recently got married? Treasure the special day and have your most-loved photograph printed onto triptych canvas. In full colour or artistic black and white, this is a unique way to celebrate the start of your married life together. Panoramic shots of the beach or city skylines look fabulous as multi canvas prints. Hang them above your bed and let dreams of tropical sunsets and romantic holidays wash over you as you sleep. Split canvas paintings are the perfect way to exhibit your own creative flair. Add triptych wall hangings to your portfolio and give your art a dynamic edge.